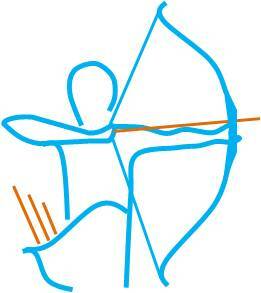 Archery is a relaxed sport and is ideal for all ages and abilities. It is a great way of getting some gentle excercise and is a very social sport. This page gives anyone interested in archery an insight into how to get started. These are run over 4 x 2 hour sessions, and are mandatory before you may join any archery club. They will teach you how to shoot in a proper manner and also safely. The course should also cover such things as parts of a bow, shooting with and without sights and the different types of bow available to shoot with. All equipment needed to take part is supplied by the club. Please see ‘events’ page for our next beginners course or contact us on facebook or email. Once your beginners course is completed, you may now join a club. It is not mandatory but hugely advisable as you will need further coaching and advice to take you forward, improve your new found archery skills and help you with the purchase of your euipment. When you are on your beginners course, you can ask for advice from the coach. There is so much equipment on the market, it can be extremely puzzling for a beginner to fathom what they need. Archery is the same as any sport, you can throw a lot of money at it and, unless you know what you are looking for, end up with something that is impossible to shoot. There are a wealth of archery euipment suppliers out there, both on the internet and shops, such as Quicks, Aim4sport, Custom Built Archery, Merlin Archery and TargetCraft. Parkfield Archers mainly use Clickers Archery of Norwich. Clickers have excellent archery experience and customer service plus equipment to suit beginners to world champions. When you go to purchase your new equipment, be prepared! it can take up to 3 hours to be properly fitted for it..